4. 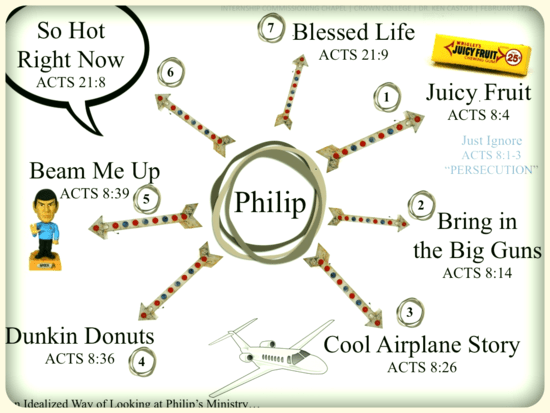 DUNKING DONUTS: The opportunity fell in his lap, so Philip told the Ethiopian about Jesus. And as they are going they see some water and the Ethiopian initiates (not Philip! ), “Hey, there’s some water, why shouldn’t I be baptized?” And Philip agrees, “Yes, why shouldn’t you be baptized? Let’s do it!” And there is this great moment in ministry. This story is a testimony to God more than it ever should be a testimony about Philip. This is low-commitment stuff… but we often glamorize the coincidental over the cultivated fruit of ministry. But my brain manipulates the story and convinces me that this sort of moment is just the kind of moment that should always be happening in ministry if you follow after God and love God and love ministry. This is just the way it’s supposed to work, right?